I’m new to this “tradition” (if the term applies to something so young) initiated by Indiana blogger Carol of May Dreams Gardens. On the 15th of every month, she asks all bloggers to show what’s growing in their gardens. Here’s what’s happening in (and around) my Zone 6 Toronto garden, starting with the top picture, the spidery mature look of my ‘West Point’ tulips. 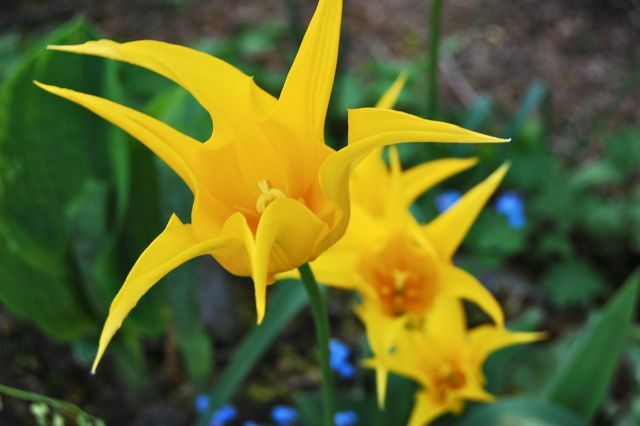 The ‘Angelique’ tulips have been open for a few days. I had half a dozen of these originally. It’s interesting to see that the squirrels have planted some of them in gardens down the street. These white Tulipa viridiflora are in my neighbour M’s garden. But since he and I (well, mostly he) removed the privet hedge dividing our two front lawns, the garden lines have blurred and we share the tending of one big front garden. The ‘viridiflora‘ are named for the green striping in the flower, and come in other colours. He put these with deep red peony-flowered tulips. Nice. 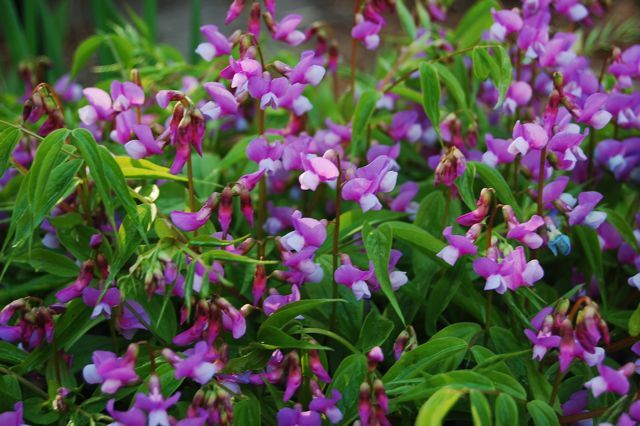 Lathyrus vernus or vernal sweet pea is on the wane. This excellent performer should be planted more often. It grows about a foot tall in my dry garden, and for at least a month is covered in blooms that gradually change colour as they age. The bees love it. 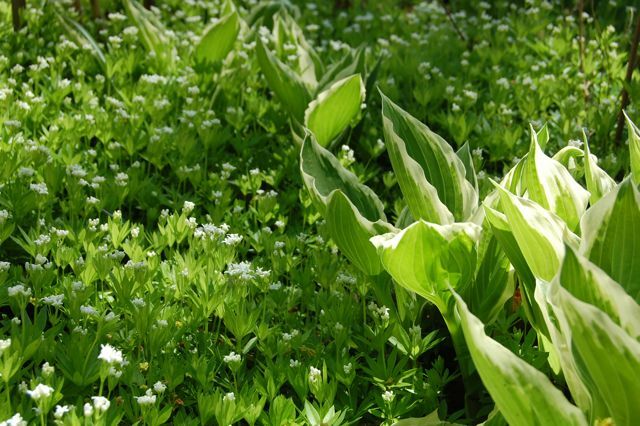 Galium odorata or sweet woodruff gets its starry white flowers now above its whorled leaves. You can see, it’s a, what shall we call it, enthusiastic? groundcover. 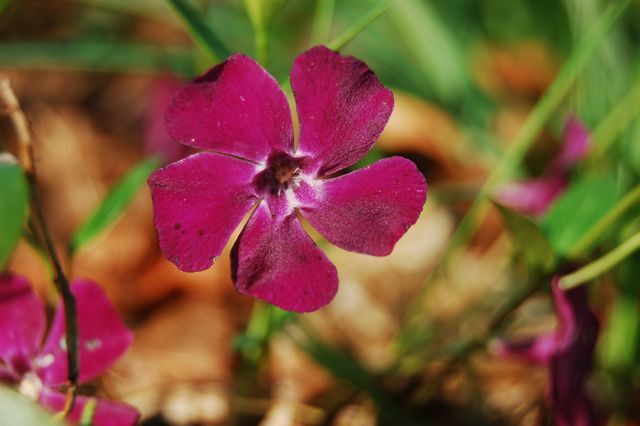 In a wetter position, it might be called invasive, but it’s relatively welcome in dry shade. This little plant has a long and interesting history, which you can read about at Paghat’s Garden. This purple form of periwinkle, Vinca minor ‘Atropurpurea’ was planted only a couple of years ago, and it’s doing very well. It’s in the sunnier area at the front, and is blooming along with the sulphur yellow Euphorbia polychroma or cushion spurge. Beside them, my old purple intermediate bearded iris is in bud and readying to pop over the next week. This iris came with the house, and I’ve spread it in a neighbourly way up and down the street. A number of natives are also pushing up blooms. 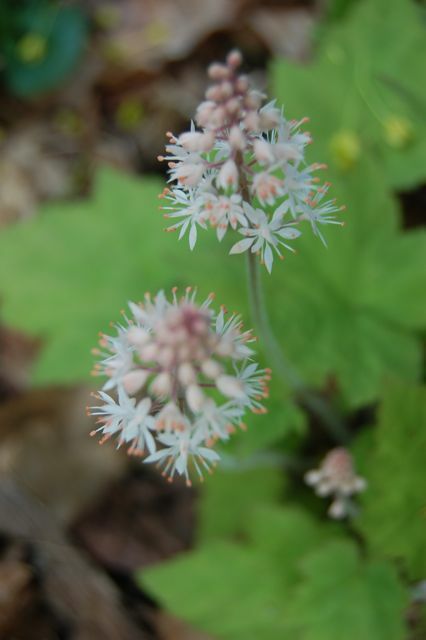 Tiarella cordifolia or foamflower is one of the dainty, low-growing flowers that I wouldn’t want the sweet woodruff to get too close to. I’ve seen foamflower planted in masses very effectively elsewhere. In my garden, it’s more like a “light froth” flower. But it always delights me to see it in bloom. 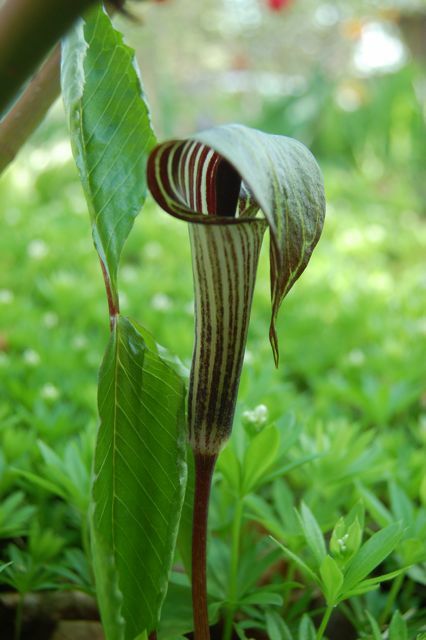 This is one whose height allows it to compete a bit better, the Jack-in-the-pulpit or Arisaema triphylla [oops, I mean, triphyllum]. Again, it belongs to M, but is right at our property lines. M has this striped one, and a greenish white one, both having been in bloom for a couple of weeks. 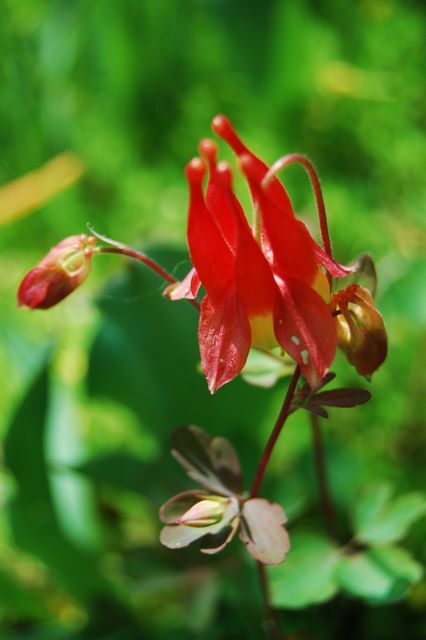 And here’s an old reliable in Sarah’s garden, Aquilegia canadensis, the native columbine. It’s blooming here in the hellstrip between her sidewalk and the next — under Norway maples and in shade. Delicate, but tough. That’s the way we like ’em. Wow … again, I see strange flowers but very beautiful ones. I wish I have those in Malaysia as well. My jaw dropped just by looking at their photos. They are gorgeous and unique. I just posted my first GBBD. They are all gorgeous. I just love jack-in-the-pulpits. There is something so exotic about them. Happy GBBD! You have some glorious blooms today. 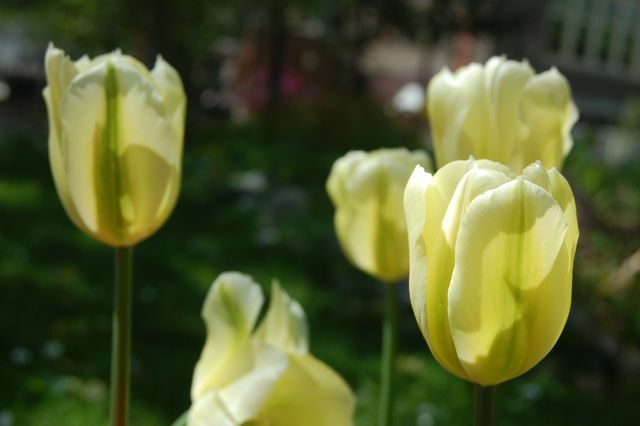 I really love those West Point Tulips, such an interesting shape. 🙂 Happy Bloom Day! Hi Helen, what a fabulous first bloom day, and I would call it a tradition, first started in March? 2007 and every month since. How nice to share the garden bed with your neighbor. He has some fine plants too, love the viridiflora tulips especially. I have never heard of the vernal sweet pea and will look for it. Seed grown? Helen, thank for stopping by Keewee’s Garden. To answer your question on my mini cabbages, I went out and took a look at the label, and they are simply called, mix, mini cabbage. I bought them from my local garden center but there is a website on the label you could check out. Thanks, everyone, for dropping by. Blossom, I loved your orchids. Wish I had the patience to grow them (My sister has one). ImpatientGardener, jack-in-the-pulpit is exotic looking — amazing to see it growing wild here in Southern Ontario. 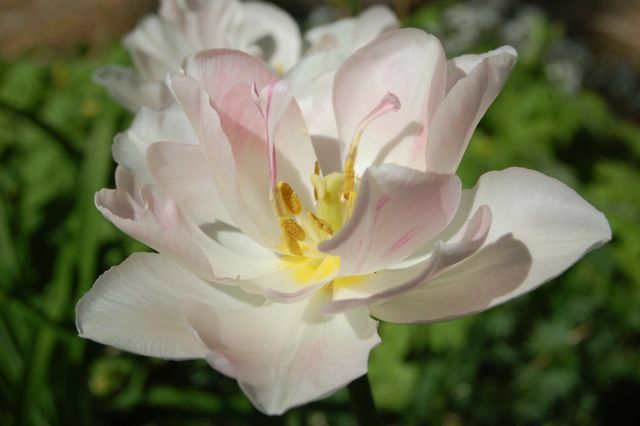 PerennialGardener, the West Points are like the Martha Graham of the tulip world — the petals are always moving into elegant and different dance positions. I love them. Frances — the vernal sweet peas were purchased in pots, but they are seeding themselves gently here and there, so I’m sure they’d be “seedable” if you could get your hands on some. Unsure what the cross-border policy is on seed exchanges. Keewee, thanks for the link. I’ll keep my eye out for something similar around Toronto. So many blooms! Thanks for the idea, I am going to post our Montana blooms – all three of them! Happy bloom day! Great flowers. I love to see some tulips, with temps forecast in the 90s tomorrow (a freak heat wave). And that Jack in the pulpit really makes me want to take a trip up north. Hello Helen, What a nice blog you have here! I have been busy poking around and have enjoyed this lovely blog very much. Even more so with the fact that you do it with your sister. I am a gardener with mirrors everywhere. Hopefully I’m not the Lady of Shanghei, but my house seems so small and the garden sometimes dark that I adore the mirrors-everywhere. I only have mirrored balls in the garden, but do have a mirror on a covered porch. Folks around here find it strange, but it makes me happy. I loved your lady in the tub post! I always like to learn these new things about plants and you can bet I’ll be trying this with my bleeding hearts today. Have a great day.